I rarely write up rides of less than 100 miles, but given how disappointing 2018 has been, it’s worth mentioning how nice Sunday’s Pittsburgh Randonneurs Kittens & Puppies 100k (that’s 62 miles) was. We started 25 miles down the Ohio River in Monaca PA, then headed north along the Beaver River—almost to Ellwood City—then paralleled the PA Turnpike northwest to New Middletown OH, and back along the same route. So what was so good about it? First and foremost, the weather was stunning, and the view from the start on the Ohio riverbank was gorgeous. We’ve had 14 inches more rainfall than average this year, which soaked or canceled several events and regular weekly rides. So we were very appreciative of a beautifully sunny late summer day. Later some high clouds from Hurricane Florence rolled in, which conveniently kept the afternoon heat at bay. I also got to ride with friends I haven’t seen much this year, including De’Anna and Jim. I enjoy riding with randonneurs, because they keep a perfect pace: a good clip, with businesslike rest stops, but easy enough to keep riders from blowing up. It’s the perfect middle ground between group rides composed of either hammerheads trying to ride each other into the ground or lazy tourists who are horrified at expending any effort at all. Not a highlight, but something to be thankful for: at one point I missed a turn and made a sudden, sharp retracement in a patch of gravel. Both wheels skidded out from under me, but I somehow managed to keep it up, and no apparent harm was done to tires or wheels. 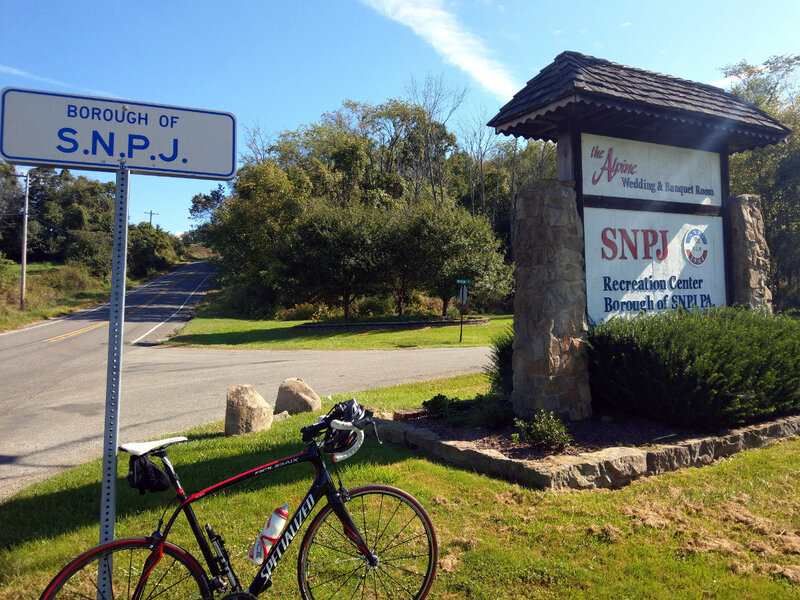 Two-thirds through the outbound leg, I took a four-mile detour off the route in order to check in at a place I’d always wanted to visit: the oddly-named town of S.N.P.J. Pennsylvania. The turn-around rest stop was a sandwich shop, where the cashier chose not to charge me for the cola I grabbed. I’m not sure whether that was because I’d waited and let a couple other customers precede me or if it was some other “thing”. After the ride, four of us stopped at Yolanda’s Pizza, where I acquired a much-anticipated pepperoni, sausage, and ham calzone. But above all, it was nice to be out there and enjoy one of the few beautiful days we’ve had all year. The outlook for the rest of 2018 is cautious. I won’t be training as hard for this year’s Dirty Dozen, but I’ll probably do a few of the friendly prep rides. I may or may not do the event itself—that’ll depend on weather and how I feel—but if I do, it’ll be as a fun ride that I won’t take terribly seriously.